Khush Wedding is a luxury bridal magazine for British Asian couples across the UK, celebrating love, marriage and happiness. 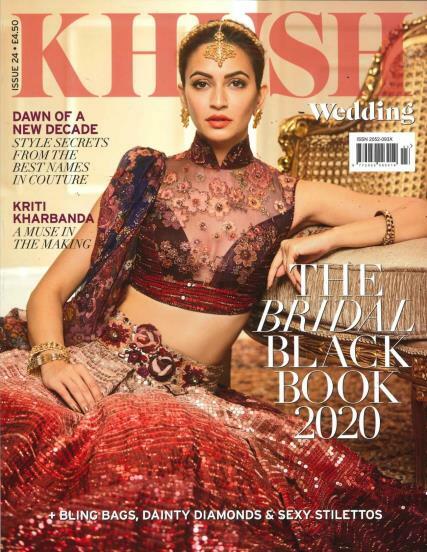 Buy a single copy or subscription to Khush Wedding magazine. 'Khush' is the Hindi word for 'happy', and that's what is brought to readers; innovative ideas and inspiration for couples, their friends and families, who are planning the happiest day of their lives. Launched in print in April 2013, Khush Magazine is the growing fast with 175,000 readers nationwide and counting. In each issue you can find insightful features, the latest in Asian bridal and occasion wear, planning ideas and reviews of the UK's most romantic wedding venues, and plenty more besides. Whether your Big Day is a few years away, or just around the corner, Khush Wedding has everything you need to be your comprehensive guide for wedding day bliss. I am a modern Indian lass from London. This has been great inspiration for my wedding!